Want to check out the morning news in London, help out in emergencies, or tune in to the big race? Two-way radios open up a world of possibilities - literally. 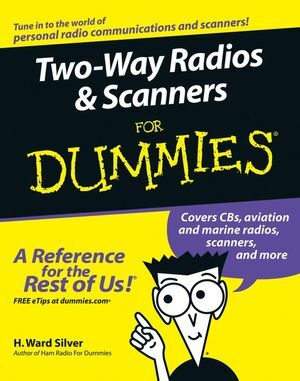 This handy guide tells you about the equipment you need, fills you in on radio etiquette, shows you how to stay legal, and gives you lots of cool ideas for family-friendly radio activities. H. Ward Silver has experienced a 20-year career as an electrical engineer developing instrumentation and medical electronics. He also spent 8 years in broadcasting, both programming and engineering. In 2000, he turned to teaching and writing as a second career, producing Ham Radios For Dummies in 2004. He supports Seattle University’s Electrical and Computer Engineering Department in laboratory instruction. He is an avid Amateur Radio operator, Extra Class, first licensed in 1972. Each month, his columns and articles can be found in the national ham radio magazine, QST, published by the American Radio Relay League (ARRL). He is the author of the ARRL’s online courses in Antenna Design and Construction, Analog Electronics, and Digital Electronics. When not in front of a computer screen, you will find him working on his mandolin technique and compositions.